Apple unveiled its new iPad. The new tablet has many new features, but will simply be called “the iPad” or “the new iPad”. Apple unveiled the latest version of its iPad on Wednesday. The new tablet has many new features but no new name, according to a report in The Associated Press. The tablet, which will go on sale next week in the U.S. and several other countries, will simply be called “the iPad” or “the new iPad”, and not “iPad 3”, the report noted. The new iPad has a sharper screen, driven by a faster processing chip that acts as the “brains” of the device. The new features mean the tablet computer will be slightly thicker and heavier than the iPad 2, since it needs a larger battery to power the high-resolution screen. The battery life of the new model remains the same: about 10 hours of use. Apple said the new display will be sharper than the average high-definition television set. 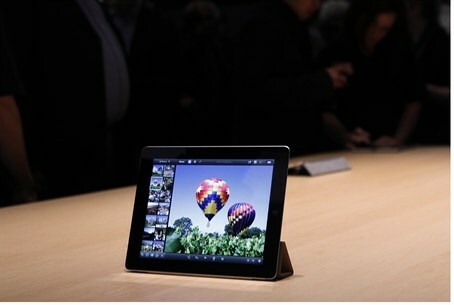 The new screen should be able to show all the detail in high-definition movies, which the iPad 2 does not, AP noted. “We are taking it to a whole new level and are redefining the category that Apple created with the original iPad,” Apple Inc. CEO Tim Cook was quoted as having said at the launch event in San Francisco. The new iPad will go on sale March 16 in the U.S., Canada and ten other countries. A week later, it will go on sale in 25 more countries. Prices aren't changing from the previous models and will start at $499. Versions capable of accessing cellular networks will cost $629 to $829. The new model also features a higher-resolution camera on the back, similar to the one in the iPhone 4S, AP reported. Apple also confirmed that the new model will come in a version that can use Verizon Wireless' and AT&T Inc.'s "LTE" wireless broadband networks. They offer speeds that are faster than the 3G networks used by previous iPads, and current iPhones. Apple is updating some of the software on the tablet to take advantage of the new features, noted the report. For example, it will be introducing a version of the Mac's iPhoto photo organization and manipulation program for the iPad. The basic model of the iPad 2 will be kept in production, AP noted, and the price will be dropped to $399.